Another amazing and lucrative poker game from Microgaming that will blow your mind with its fantastic gameplay is Aces and Faces Power Poker. This is one of the Poker games in their Power series and is a powerful game which is capable of getting you big rewards. This is a fast-paced poker version. You can play four to a hundred hands at one time. As the name suggests, the Aces and the Face cards are the highest paying cards of all the others in the game. The look of this Aces and Faces Power Poker is similar to the others in this category. The table is blue in colour and the cards are dealt with the players on it. You can see the paytable as well as the buttons to adjust the number of coins, the value of coins and much more at the bottom. If you want the biggest payouts, it is best to place the maximum bet on at the game. The coin size can vary from 25p to £5 per hand. You can bet up to 10 coins per hand. You can click on the Double button to double the winning. The gameplay of Aces and Faces Power Poker is easy to understand and can be played by even the beginners. This Poker casino game is played with a deck of 52 cards that are shuffled randomly after every hand. 5 face-up cards are dealt with the player and you need to make combinations. The Royal Flush has the highest payout of 4000 at the maximum bet. Once you have drawn the first 5 cards, you will have to decide whether or not you want to hold or discard these cards. For this, you will draw another set of 4 cards. The gambling feature is one of the most exciting features of this game. You need to click on Double and you can now double your winnings. All you need to do is find the highest value card amongst the four face-down cards that have been dealt with you. If you win, your winning will be doubled, if you lose, you will lose everything. 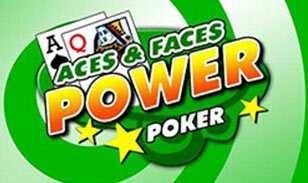 Aces and Faces Power Poker game has been designed fantastically. On the left, you can see payouts for each bet in coins.